Within the next hour, 6 Canadians will suffer a brain injury. It's that common. That's why the Brain injury Association Of Waterloo Wellington is on a mission to teach kids and families the importance of keeping your head and brain protected. 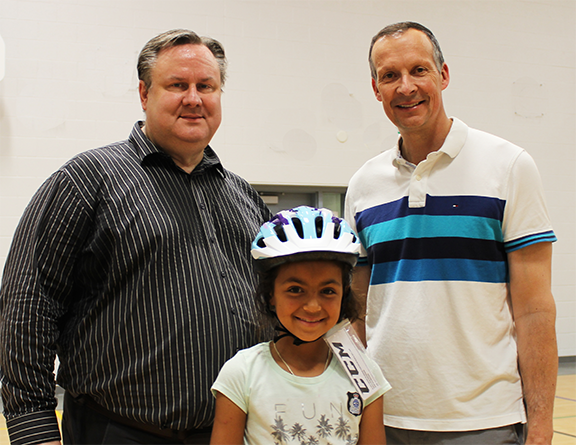 This past week local members of the Ontario Trial Lawyers Association (OTLA) visited a local Public School where they donated more than 40 bicycle helmets to grade two students with the assistance of the Brain Injury Association of Waterloo Wellington. Rob Deutschmann and George Dietrich are two Waterloo Region based disability and personal injury law firms and members of the OTLA’s Bike Helmets on Kids campaign. This year, the entire campaign will help distribute an estimated 4,000 bicycle helmets to children in cities and regions across Ontario. A helmet protects best when it fits.If a helmet doesn't fit properly it isn't going to protect you the way it should. The local Lidz on Kidz safety educators and brain protector advocates played an important role by sitting the helmet recipients down for a 15 minute lesson on the vulnerability of our brains and the importance of wearing a helmet everytime we cycle. They also stressed the importance of parents and adults being good role models by also wearing a helmet each time they cycle with or without their children. Adults, need to show children that our brains need to be protected. Acquired brain injury has become recognized throughout the world as a problem of epidemic proportions and it has became known as the Silent Epidemic.